Bob was born on 18th November 1894 in Burra to parents Waldemar and Isabella Hawkes of Koonoona and was one of seven children. He was educated at Queens School North Adelaide and went on to become a station overseer on the family property. He served in the cadets for 18 months and then in the 23rd Light Horse for 18 months before enlisting at age 19 on the 27th October 1914 as a Lance Corporal. As a member of the 9th Light Horse Regiment he embarked from Melbourne on board the transport A10 “Karroo”. After training in Egypt he went onto Gallipoli were he was badly wounded at Walkers Ridge supporting the tragic attack by the 3rd Light Horse Brigade at dawn on the 7th August 1915. He was shot three times through the neck and shoulder. 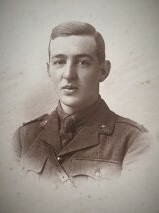 Bob was wounded in action again on the 18th November 1916 in France. (Gun shot wound right thigh) He recovered in England and then underwent further training and proceeded to France in August 1917 with the 21st Machine Gun Company. Now in Belgium he was promoted to Lieutenant 6th September 1917. This was during the third battle of Ypres. Many would afterwards call this offensive, actually a series of battles, after the name of the village that had become the last objective – Passchendaele. In his last letter home he writes “… I feel pretty confident about pulling through alright …. I was buried by shells, twice….we got our fair share of gas … but at times one has to think hard when your gun teams get blown out all around you.. however in the world we were missed this last time, I don’t know…” Bob and his team were killed in action 29th October 1917 by a direct hit from a high explosive artillery round in the final assault on the village of Passchendaele. Hi sbody was never recovered and his name is on the wall of the Menin Gate Memorial in Ieper, Belgium.